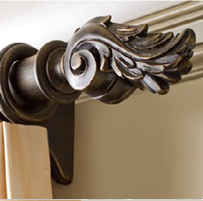 Over twenty years ago, The Antique Drapery Rod Company was founded to bring the quality of museum collections and authentic antique hardware into our homes. Using old world craftsmanship, hand forging, hand casting and hand painting is an eco responsible process for the health of our employees, our customers and the planet. 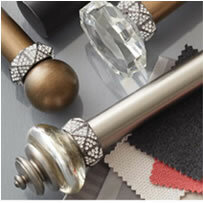 We are proud to offer our latest collection designed for Classical Elements by Thom Filicia. Featuring a moder n blend of wood and metal finishes. All of the wooden components are made of oak source locally in Western NC. 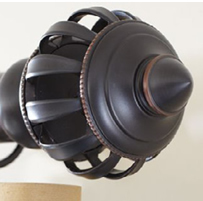 A streamlined 3/4inch diameter pole collection, offered in both wood and metal options. 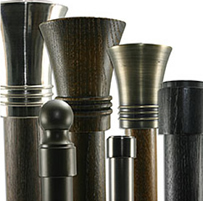 Our 3/4inch wood poles feature a unique steel insert to add strength and rigidity to such a narrow wood pole. 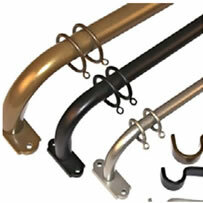 Many bracket options exist, including a passing bracket which offers long lengths of free flowing curtains. 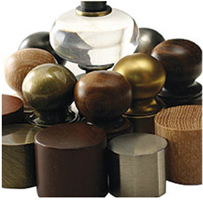 Simplicity Metal offers a vast selection of finials and many bracket solutions. Four distinct hand rubbed metal finishes are available. This group is based around 1inch steel poles. The Simplicity Wood Collection is our core group based around a 2inch wood pole. All of the components are made of plantation grown tropical hardwoods, finished with a unique 7 step process. The finishes all feature a slight distressing effect combined with light glazes. 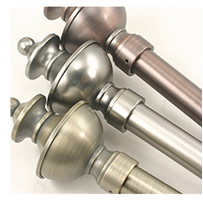 A dramatic collection of decorative drapery hardware, Kirsch® Designer Metals® features a breadth of styles, finishes and sizes that bring enhanced beauty, functionality and timeless quality to décor. Designer Metals is an unparalleled designer resource that provides the tools and freedom to create truly distinctive home décor. Old World Spanish influences embrace moder n touches in the Kirsch® Wrought I ron Collection. Kirsch designers, in concert with interior designers from around the country, shaped this exciting collection that ranges from classic pro f i l e s to unmistakably modern motifs. A striking expression that is both organic and sophisticated, the new Wrought Iron Collection can complement any interior design vision. 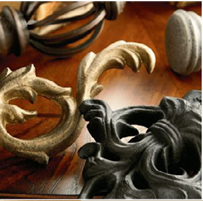 An exquisite collection of decorative drapery hardware, Buckingham®, features a breadth of styles, finishes and sizes that bring new levels of beauty and timeless quality to the décor. Buckingham® is an unparalleled designer resource that gives you the tools and freedom to create truly distinctive home décor. 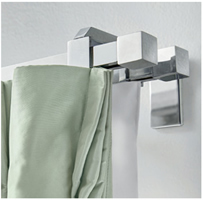 Simple designs blend into any contemporary environment, and versatile styling give you more flexibility. 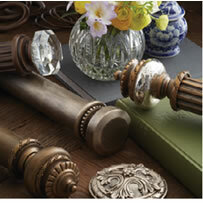 With an update on tradition, the Wood Collection adds sophistication to any window. 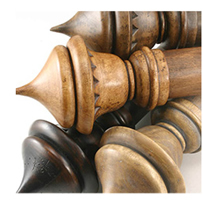 Elegant and dramatic, large scale finials provide distinction. 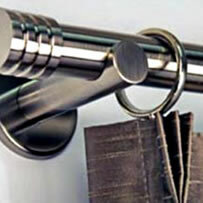 Tech Drapery Hardware features 1-1/8” compatible metal rods and components in three stylish metal finishes. 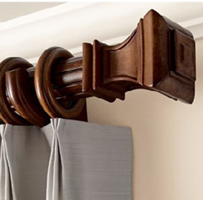 You will find the Tech hardware easy to install with push-on compression finials and collar brackets.The Tech silicone lined drapery rings allow the hardware to carry heavier curtain fabrics with less drag. Three sizes to fit all window treatment installations. 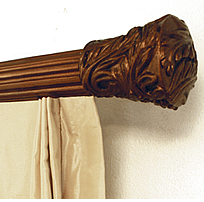 One Sided systems designed to enable drapery to flow into adjacent wall. 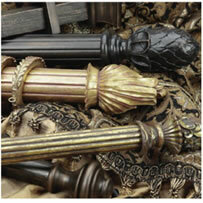 Menagerie is dedicated to creating decorative window treatment hardware that is both unique and fashionable.